Brooklyn blog Lucid Culture published a nice review of last week’s show in Williamsburg, citing us for “blasting through one fiery, smartly lyrically-driven anthem after another….concluding with ‘The Interstate’, a towering, distantly Springsteenish highway alienation anthem“. Read the full review here . Wormburner has been hand-picked to play Hipster Demolition Night II at Glasslands Gallery in Williamsburg, Brooklyn on Thursday July 15th. This will be a great garage rock bill also featuring Muck and The Mires and Jay Banerjee & The Heartthrobs. 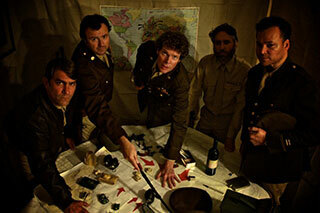 “…enter New York quintet Wormburner, playing the release show for Hoboken-recorded sophomore LP Placed by the Gideons. “Breaker Breaker” introduces Temptation Hank & Co. all dressed in black, and we’re talking punk-pop storytelling from the get go. Talk-singing like The Hold Steady’s Craig Finn, ‘Burner’s lyrics are Jersey-dreamy: “And we’ll ride this lonesome highway ‘til it ends, you be the one that heaven sent me. We’ll kill the headlights just in case, I know a stretch of road so empty, Breaker Breaker what’s your twenty?” The Gaslight Anthem, anyone? Bassist goes drummer, guitarist goes keyboardist, singer goes bassist etc. in a number of instrument swaps through a solid gig that eventually finds Wormburner at next-to-last “The Interstate,” a story of princess Sally that renders these guys at their finest. The date is set for our record release show. Wormburner will play at The Bowery Ballroom on Thursday June 17th to celebrate the official release of our second LP titled Placed By The Gideons. London Souls will share the bill with us. 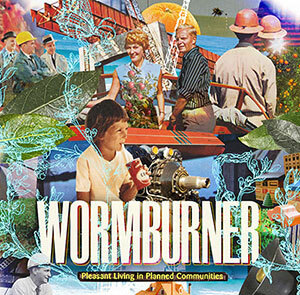 Wormburner is playing a headlining slot at Pianos on Friday April 23rd. Pianos is located at 158 Ludlow Street on the Lower East Side. Our last New York City performance sold out ten days in advance of the show, so get your advance tickets for this Pianos show by clicking here. We are getting some serious new airplay on one of the top college radio stations in the country. Rutgers University’s WRSU is playing our music, so we’re coming out of hiding for a one-off St. Patrick’s Day Show at The Court Tavern in the Rutgers college town of New Brunswick, NJ. Recording sessions are winding down, and we have begun mixing the new album. Our 10-song sophomore LP will be titled Placed By The Gideons. We are taking a short break from playing live to tidy up and prepare for the official record release (think late Springtime). Keep checking back for details. In the meantime, you can sample some songs from the forthcoming record by clicking here. We end the year with more good news from our friend Kevin Allison of The State. Kevin has once again chosen to feature some Wormburner music in his new storytelling podcast series, which just cracked the Top 10 in the iTunes Music Store’s Comedy category. Listen to Wormburner as generously featured in the latest episode of RISK! by clicking here. Tis the season and once again New York’s own 101.9 WRXP is playing our Christmas Single Bells of St. Ignatius. Get your own copy of the song for just ninety-nine cents in the iTunes Music Store.